PennHIP .35/.36. These are very good distraction indices. Mags has very little risk of ever developing hip dysplasia. Matching these scores with a lean body and a very fit little girl, her risk of hip problems down the road is very low. Mags' sire, Buster, was OFA Excellent at 8 years of age. 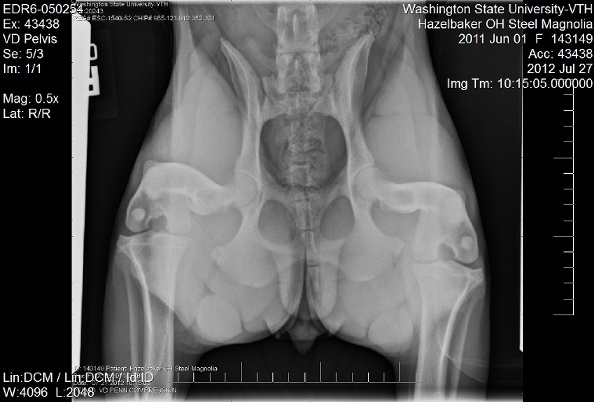 Of all of the dogs closely related to him that have also had their hips evaluated, all have had consistently good hips. With that 'depth' of pedigree in the hip department, Buster's genetics countered the loose hips from Ember, and produced these hips. One of Mags' littermates also has hips with similar DIs. PennHIP distraction view of Mags's hips. You can see that her hips are both pretty tight, with the balls still well-seated in the sockets even under tension. 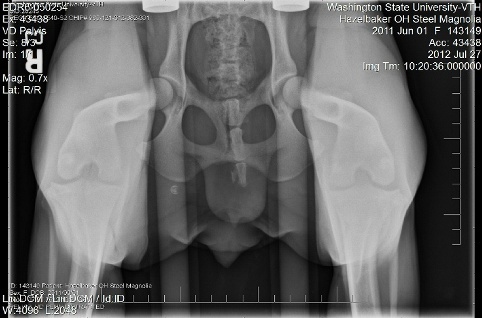 As a comparison - to the right are Ember's hips under the same tension. They aren't nearly as tightly fit. PennHIP extended view of Mags's hips. You can see how tight her hip joints are. The ball is well-seated in the socket, and the shadow of the socket almost completely covers the ball. This is the view used by OFA. I did not have an OFA evaluation of her hips done. She was just one year old when I had the x-rays done, and OFA requires that they be a full 24 months old for an official reading. 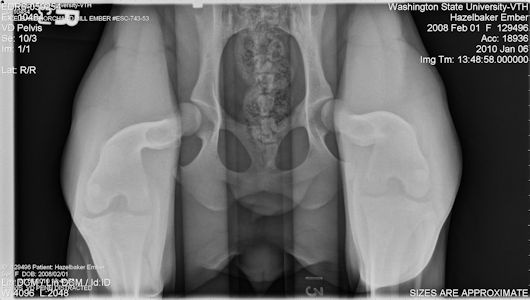 PennHIP compression view of Mags's hips. This view shows how well the ball and socket really fit together. Mags's ball and socket are almost perfectly congruent.